“Talladega Nights,” reportedly Gen. Stanley McChrystal’s favorite, is a crazy fun flick. Unfortunately for McChrystal, the movie he should have paid more attention to was “Almost Famous.” He might have figured out that what Rolling Stone is all about is stripping people naked and making them appear ridiculous, even while proclaiming there is something noble and uplifting in it all. He might have figured out that, as the rock star in the movie proclaims, Rolling Stone is “The Enemy.” And he might have figured out that, because he isn’t running a rock band, Rolling Stone doesn’t offer the same kind of redemption to a military man, a breed the magazine fundamentally misunderstands and viscerally dislikes. Then he might have figured out that, unlike ”Almost Famous,” where the plane pulls out of its death spin after all the true confessions and the band achieves rock redemption, his plane and all the passengers on it might not. Which is too bad, because there is more at stake here than some rock star’s career. Maybe McChrystal would have thought twice before he allowed Rolling Stone to take control of his war. Most of all, the commander-in-chief must take command. Barack Obama’s commitment is famously and publicly uncertain. No one—not his lieutenants, nor his cabinet, nor his generals, nor the American people, nor our allies, nor the Afghans, nor our enemies—can be sure whether the president wants to win the war or just to end the war. As exemplified by the fact that we are now in danger of allowing Rolling Stone magazine to set war policy. Speaking of which, given that Rolling Stone is already heavily influencing, if not directing war policy, it is unfortunate that the magazine and its scribbler don’t appear to understand this war. Any of it, start to finish. The hackneyed analogies of Vietnam defeat and Afghanistan, graveyard of empires, are trotted out early and often. Counterinsurgency is presented to a readership that RS probably rightly assumes is entirely ignorant of the concept, as some novel idea that was only “beta-tested” in Iraq, as if the towering accomplishment there were some minor sideshow. In fact, Hastings’ observations about Afghanistan sound remarkably like the rampant political doom-and-gloom-mongering coming out of Congress and the media re Iraq in the summer of 2007. The Afghan surge prospects are “bleak.” I don’t know about you, but I am getting tired of people whose view of history is so skewed they can’t remember the parts they witnessed, and insist on using defeat anaologies that were shown to be meaningless the last time they trotted them out. As others have noted, the general himself says virtually none of the things that are most damning in the article. With the exception of a mild Biden joke, they are all attributed to unnamed sources and unnamed aides. 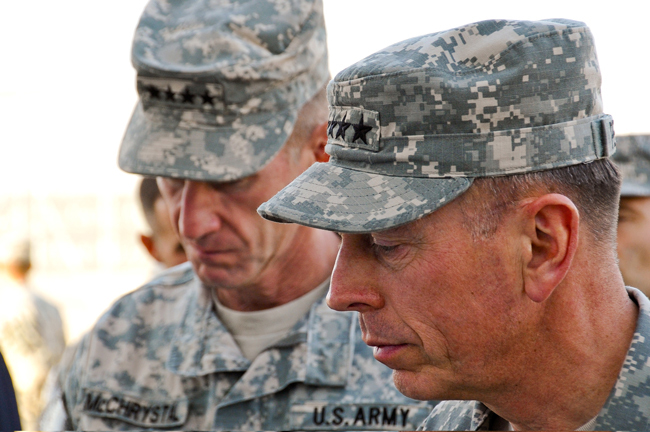 But McChrystal, in letting RS into his inner circle, gives them a gift. It’s a staff letting off steam that is decribed as “a handpicked collection of killers, spies, geniuses, politcal operators and outright maniacs.” Rolling Stone loves people like that, especially when they are loaded. We get to see them tying one on in Paris, basially with lampshades on their heads. RS tuts, apparently having forgotten the motto of one of its own leading lights. Hunter S. Thompson: “When the going gets weird, the weird turn pro.” So, we have a gonzo command to fight a gonzo war. Problem? There are other embarrassingly bad examples of cluelessness. “The Defense Department’s budget is $600 billion a year, while the State Department’s is only $50 billion.” Someone please explain to RS that the State Department doesn’t have any carrier groups, though it benefits greatly from those and other military assets deployed around the globe. That’s the “Big Stick,” not to be confused with the “Speak Softly” part. 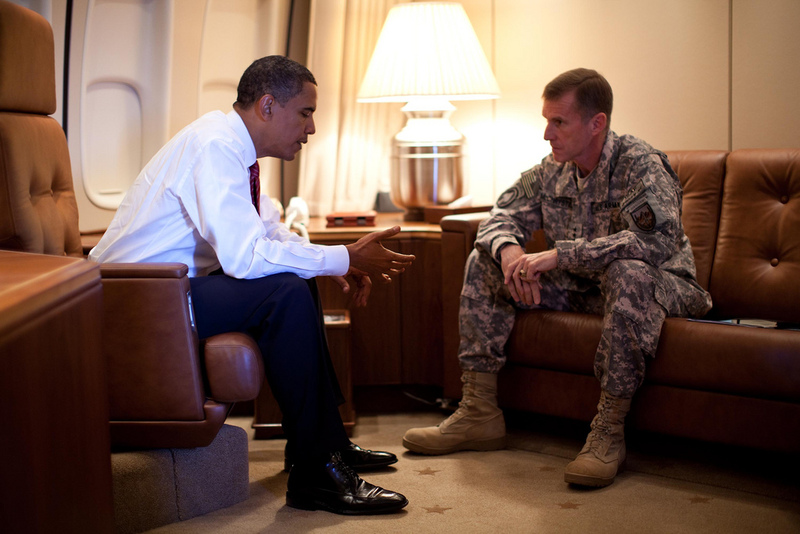 McChrystal, meanwhile, is declared to have gotten “almost” everything he asked for in his surge. In fact, he got three-quarters, with a deadline and a non-commital comannder in chief plus meddling lesser pols. I’d suggest taking away three-quarters of Hastings’ fee, maybe three-quarters of Rolling Stone’s staff and profits; then let Reader’s Digest and Entertainment Weekly into the RS editorial and publishing offices to make helpful micromanaging policy changes; and see if that feels like “almost” everything RS wanted. It’s beside the point. In the most fundamental policy aspect of the relationship between the president and the general, there have been no sign of daylight. McChrystal in this article doesn’t complain about the task as his president handed it to him, nor do his aides, whose criticism is leveled at those who have sought to undermine it. He has made the best of a bad deal, going ahead with the kind of determination in less than ideal circumstances we could only hope the commander-in-chief would exhibit in something as critical as national security. Delving into some actual substance, RS highlights the ROE problems. Here, the article suggests, McChrystal is not only failing to communicate and lead effectively, but his intentions reportedly are being rendered ridiculous somewhere between utterance and executiion. This might have been a more useful area of serious exploration by Rolling Stone. However, Rolling toe isn’t in the business of examining and criticizing the effectiveness of actual policy and strategy. Rolling Stone is in the business of making and breaking stars, and that is what this article is about. To this end, there is the other rock star in this spectacle. President Obama. McChrystal never actually disparages him in the article, though he and his aides may launch barbs at the bass player, the doo-wap singers and the roadies. McChrystal isn’t the first general to shoot his mouth off … or to preside over a staff that is guilty of making some indiscreet remarks in some unwisely unguarded moments. Many have before. The question is whether this general can still do the job and do it well. The question may also be whether there is something fundamentally wrong with the job as configured, whether the random anonymous jokes and gripes that everyone is exercised about reflect serious problems that need to be addressed. All that means that Barack Obama will have to be something he has been publicly unwilling to be. A committed, determined and aggressive wartime leader. RS’s own remarks on that make it clear he has impressed exactly no one on that score, even if Rolling Stone doesn’t seem to think winning is possible or particularly important. Hopefully, our president will be presidential enough to figure out that it is important and even winnable, that it is his war and not Rolling Stone’s, and as Donnelly and Kristol suggest, use this crisis to fine-tune it instead of turning it into some kind of bad 1980s hair band’s pyrotechnic spectacle. Charley didn’t get much USO. He was dug in too deep or moving too fast. His idea of great R&R was cold rice and a little rat meat. He had only two ways home: death, or victory. 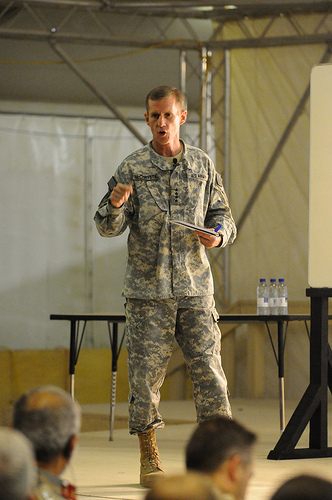 Last month, Army Times reported that senior U.S. Afghanistan commander General Stanley McChrystal had ordered the closure of fast food outlets and other retail shops at FOBs throughout his AO. According to the article these will include “Burger King, Pizza Hut, Taco Bell, and Popeyes, as well as new-car sales offices, jewelry stores, souvenir shops, and other retail outlets.” The number of first run movies will also be reduced. Hall’s statement implies two different reasons for the order. Perhaps the most important is McChrystal’s hope of maximizing that which, like being too rich or too thin, one cannot have too much of: efficiency. Supplying these retail outlets adds to the military’s logistical burden; moreover, there is also the more urgent question of managing the peregrinations and security screening of non-essential civilian personnel. But significantly, Hall offered another reason: these outlets, often crammed together in strip mall like settings, exist in stark contrast to the world outside the wire, often a strange, bleak place of anxiety, real danger, and extreme poverty. This contrast seems to have struck Hall and his general as incompatible with a war zone. What exactly is the issue with having “an amusement park” near a battlefield? Is it just a question of bad aesthetics or perhaps poor taste, like boorish behavior or jokes at a funeral? I think it is much more than this, and reflects a recent cultural trend. Understandably for those times, films, those great cultural reflecting pools, did not at first engage this issue. But that changed in the aftermath of Vietnam. Perhaps searching for reasons to explain America’s Vietnam experience, Hollywood seized on part of the British complaint and then some: the level of amenities given American soldiers reflected national decadence, was contrary to the Spartan ethos that for millennia had defined soldiering, and stood in sharp contrast with the enemy, who was depicted as having a greater willingness to suffer for its victories. Thus, Francis Ford Coppola produced Captain Willard’s observation quoted above, not to mention the brutally Spartan character of Col. Kurtz, who was successful precisely because he lived off the land and ignored the constraints of “over-civilized” US tactics. Coppola was not alone. A host of acclaimed Vietnam War films extended this trope. Oliver Stone’s Platoon (1986) and Stanley Kubrick’s Full Metal Jacket (1987) similarly emphasized the decadence of life inside the wire versus the harsh realities that lay outside. Inside the wire were hot meals, showers, drugs, alcohol, mail, and music; outside the wire lay indescribable violence, death, and chaos. These and other films clearly suggested a connection between military defeat, film characters’ personal dysfunctions and the soft living of the artificial “mini-Americas” depicted inside the wire. Movies are not reality and screenwriters, directors and producers are no more expert about combat life or military morale than any other group of civilians. But movies are super-powerful meme conveyors; memes, repeated often enough, will embed deeply in culture; and once they become cultural assumptions, are ideas that no one, in or out of a uniform, can easily escape. Captain Willard helped establish one of those memes, and it appears that whether it reflects reality or not, General McChrystal, like many of us, has read the script. Richard F. Miller is a military historian and sometime journalist, with reporting stints in Iraq and Afghanistan. His next book is the forthcoming, “Fighting Words:Persuasive Strategies for War and Politics,” (Spring, 2010.) Miller may be contacted through his website, www.millerrf.com.